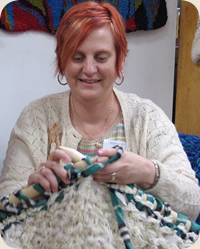 Donna is a fun and dynamic teacher who loves spending time with other knitters. Donna’s passions are traveling and sharing knitting knowledge while visiting new landscapes and learning about interesting cultures. Donna has been to Alaska several times to research and promote her book, Arctic Lace: Knitting Projects and Stories Inspired by Alaska's Native Knitters. She has worked closely with members of the Oomingmak Musk-Ox Producers’ Co-operative, and has also visited the Musk Ox Farm in Palmer, the Large Animal Research Station in Fairbanks, and many museums and archives to interview experts on knitting, musk oxen, and Alaska history. She spent time in the village of Unalakleet meeting knitters and other residents while she was learning about Yup’ik and Inupiat culture. After learning to knit lace while working on her second book, Donna has become an expert in the field of lace knitting as well as a connoisseur of knitting techniques and traditions from around the world. Her desire to learn and teach these techniques has led her to many workshops around the United States as well as in England, Scotland, Switzerland, and Lithuania. Donna Druchunas grew up learning many different crafts from her mother and grandmothers including knitting, crochet, rug-hooking, embroidery, and sewing. After a 25 year vacation from crafts, she started knitting again and learned to spin and dye wool with natural dyes. Before Donna returned to knitting, she spent almost 20 years working in corporate cubicles as a writer, designer, and creative services manager. Her cubes were in military training facilities, small businesses, and large corporations. During that time, Donna wrote and designed marketing materials, training courses, and technical manuals for many types of hardware and software products. Donna also streamlined documentation production processes for several companies. She was recruited by Fujitsu-ICL Systems and Hewlett-Packard's Colorado storage division to establish in-house creative services departments and to implement procedures based on systems she originated earlier for the US Navy Fighter Weapons School at NAS Miramar and Pyxis Corporation in San Diego. After all that time, Donna rebelled and left her cubicle behind to combine her interest in knitting with her skill at writing easy-to-follow instructions. Her designs and articles have been featured in Piecework, Interweave Knits, Knitters, and Spin-Off magazines, and she has also designed patterns for several yarn companies. Arctic Lace: Knitting Projects and Stories Inspired by Alaska's Native Knitters (Nomad Press, 2006). Arctic Lace was a finalist for the 2007 Colorado Book Awards, a Silver medalist in the Foreword Magazine Book of the Year Award, and the recipient of the Independent Publishers IPPY Award Bronze.